A three movement work that features different jazz styles in each movement. The piece opens with 'Two-Hand Hot! 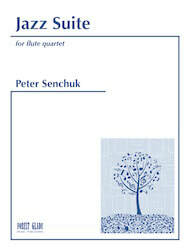 ', which is an up-tempo swing style tune that features intertwining solo lines for the entire quartet. 'KB Blues' is a medium tempo blues with a classic style blues bass line and groovin' melody. This minor twelve bar blues includes an improvised solo section for the first flute player. The closing movement, 'Irregular Swing' is a fast swing tune reminiscent of bebop classics, but with the twist of changing time signatures that keep the players and audience on their toes.